KIEV, Ukraine -- Normally the square outside St. Michael’s Cathedral in central Kiev is filled with sightseers taking photos of the famous golden-domed monastery while souvenir merchants hawk their goods. 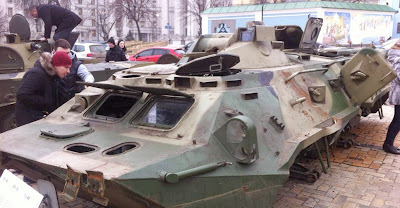 A Russian-made armored personnel carrier captured by Ukrainian government forces near Luhansk. But this past week one of Kiev’s most famous tourist spots was filled with evidence of the nearly year-old war in eastern Ukraine, including a Russian drone aircraft perched on wooden pallets, Russian tanks and armored personnel carriers peppered with shrapnel damage, and Russian Grad rocket launcher systems pockmarked with bullet holes. According to the Ukrainian military, the Russian military hardware on display in St. Michael’s Square was captured from pro-Russia separatists during recent battles. The captured equipment is proof, Ukrainian officials say, of the Kremlin’s complicity in the ongoing conflict. “It was bizarre, the rebels started out with hunting rifles,” Ukraine National Guard Capt. Alexei Lebed said, speaking about the evolution of military hardware used by the pro-Russian separatists over the course of the 10-month-old conflict. The display of captured Russian equipment in Kiev is part of a broader effort by Ukrainian officials to highlight Russia’s role in the conflict—a move meant to convince the United States and the European Union to continue sanctions against Russia and to secure additional military equipment and training for Ukraine’s armed forces. The military hardware currently on display in Kiev includes a Russian T-64 tank captured on June 13, 2014, during a battle between Ukrainian government troops and separatist rebels outside the eastern Ukrainian town Slavyansk. According to a Ukrainian information placard accompanying the display, the tank was never a part of the Ukrainian military, underscoring its Russian provenance. Also on display were several small, unarmed drone aircrafts that Ukrainian officials said were supplied by Russia for the separatists to scout Ukrainian positions in order to better target rocket and artillery attacks. Ukrainian officials have claimed for nearly a year that regular Russian soldiers have been fighting inside Ukraine, and that pro-Russian separatists are funded and equipped by Moscow. The Kremlin denies providing material support for the separatists and has said that any Russian soldiers captured fighting in Ukraine were there on their own accord while on leave. Moscow has also said that convoys of trucks crossing from Russia into separatist-controlled areas have been transporting humanitarian supplies despite claims from Kiev that the convoys were a ruse meant to conceal arms shipments. Although a cease-fire deal was reached last month in the Belarusian capital of Minsk, sporadic fighting continues in eastern Ukraine. And while major combat operations have eased off in the region, tensions still remain high. On Friday, two people were injured in an explosion in the Ukrainian city of Kharkiv. The blast destroyed a minivan, which according to Ukrainian media reports was transporting the leader of a local volunteer battalion. While the White House has so far not approved sending lethal military aid to Ukraine, Kiev’s calls for help have resonated on Capitol Hill. On Thursday, a bipartisan group of U.S. lawmakers, including House Speaker John Boehner and several top Democrats, called on the White House to send lethal aid to Ukraine to help defend against the Russian-backed separatists further escalating the conflict. “We should not wait until Russian troops and their separatist proxies take Mariupol or Kharkiv before we act to bolster the Ukrainian government’s ability to deter and defend against further aggression,” the lawmakers wrote in a letter to President Obama.